People often have problems logging into Facebook due to the following reasons: Fake Facebook URLs, accounts got hacked, network is blocking access to Facebook, forgotten password, improper Facebook login habits and others. We will cover most of these problems and their respective solutions and advice in this post. First and foremost, before you even start troubleshooting your Facebook.com login problem, you must check and confirm if the Facebook homepage you’re looking at is the correct Facebook homepage. Check the URL to see if it’s the genuine facebook.com and not other possible scam links. There has been many cases where people’s Facebook accounts got hacked because they sign in their account in some scam sites that look exactly like the Facebook home page. If you enter your username and password in such scam sites, they can of course record anything you’ve entered and attempt to sign in to your Facebook account and do whatever they want. There can be many causes of this problem. You may have visited a Trojan site or installed a bad software that injected a Trojan or spyware which redirects your facebook.com home page to any page they want. They may also set your browser’s default home page to their fake Facebook login page. In this case, you will have to scan your computer for viruses and errors (try Registry Easy), and change your default homepage back to the correct one. Always check if the Facebook login home page URL is the correct and genuine one. If you’ve accidentally entered your login details in such scam sites, you are advised to reset your Facebook account’s password immediately. Please read the next two paragraphs about how to reset your facebook password. If Facebook returns an incorrect password error when you log in to facebook.com, it simply means what it says – you’ve entered the wrong password. You may want to check if your Caps-lock is turned on. Whether it’s unintentionally or you wanted it to be on for something else previously, you may want to turn it off as it will capitalize every character you type on the screen, re-enter the password again. It sounds dumb but people make mistakes. If you’re very sure that the entered password is correct, your account may have been hacked or somebody has changed your Facebook account’s password without your acknowledgement. In this case, you should reset and change your password immediately. Please read the next paragraph about resetting your Facebook password. Forgot your Facebook password and Security questions? To reset your Facebook password, go to facebook.com and then click on the “Forgot your password” link. On the next page, you have to first find your account by follow the on-screen instruction. You can choose to enter your email address you used to sign in (or sign up) to your Facebook account. If you don’t remember your email address, try with other account’s details such as your phone number, your full name, or your username. You may be asked to enter the full name of one of your friend for the confirmation of your account. Just enter the full name of any of your friends who are in your friend list and proceed. Ask your friend for a favor to look at your About page in your Facebook profile and send you the email address that shows up under the “contact info“. Try entering your nicknames, old names, and other variations of your name just in case if one of them is used during your facebook sign up. 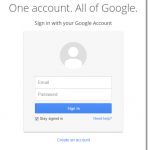 Try with different email addresses and mobile phone numbers that you have owned. After you’ve found your account, Facebook will send you an email (to the email address you used to sign up with Facebook) that contains a link to reset your Facebook password. Follow the instruction in the email to reset and change your password. This often happen especially when you’re in your college, work places, and any other serious places that don’t encourage users to surf on Facebook. Well, in that case, you may see an error 404 when you access to Facebook login home page. The source of the problem is not at your side. There’s no solution to this unless you are authorized to unblock Facebook access in your network. Otherwise, you’ll need a proxy in order to access to Facebook. We don’t encourage users to do this as some of this proxy services may as well endanger your Facebook account. Of course, not all proxies are dangerous, and in fact, most of the paid proxies are genuine and safe to use. Use a proxy only if you know what you’re doing. Do not stay signed in with Facebook. You may have heard of this advise everywhere on the internet, telling you not to stay signed in with your Facebook account. First you’ve to understand what it means by staying signed in with Facebook. When you login to Facebook, there’s an option check-box showing “keep me logged in” when you sign in to Facebook. If you tick the check-box and proceed logging in, the next time you visit Facebook you will be automatically signed in, even after you’ve closed the browser (same applies to internet explorer, google chrome, mozilla firefox) or switched off your computer. Because of this, we highly discourage user to stay signed in with Facebook if you’re using a public computer that other people can use. Well, if you’re sure that it’s safe to do that, you may stay signed in and save your time and hassle the next time you come back to Facebook. Login to your Facebook account. From the upper right side of the Facebook screen, click on the drop down menu, and then “Settings“. In the sidebar from the left, click on “Security“. Click on “Login Approval” and put a tick on the option “Require a security code to access my account from unknown browsers”. Done. The next time you sign in to facebook.com, you will be required to enter a code sent to your mobile phone. 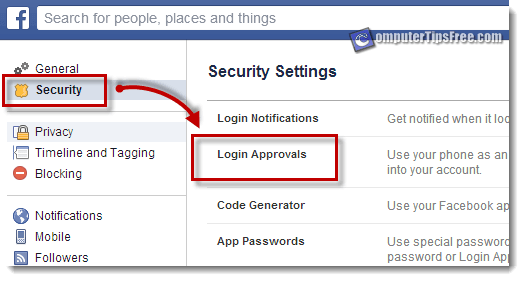 Other than the “Login Approval” feature, you may also want to take a look at other security options such as the “Login notification“, which will notify you when someone else tries to login to your account in another computer, mobile phone, or any other device that you haven’t use or approve before. There’re a lot more security features offered by Facebook that you should try if you are very much concerned about your Facebook account’s security. 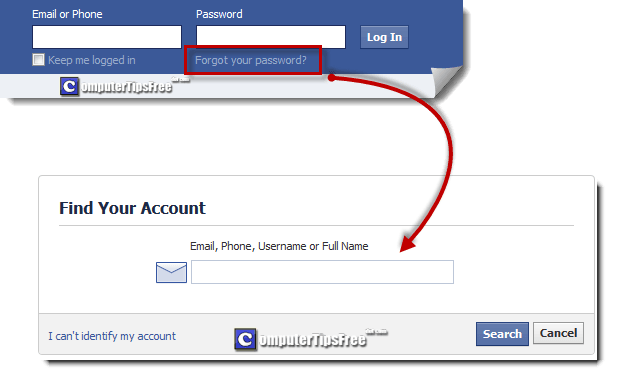 Set a stronger password for your Facebook account. There’re a lot of cases where people’s account got hacked just because their passwords are too weak. If you’ve ever received this error message when you login to your Facebook account: Facebook Account Temporarily Unavailable. You may want to check out our Facebook tips section. We cover a lot of tips, tricks and workarounds about Facebook.